Do you love transferware? I do! Since moving to our apartment, I made the decision to exclusively use my mother's beautiful Johnson Bros. china, Mill Stream. It's a nice big set too and I never seem to tire of it. I have it in the brown/multi shown here. Sweet, isn't it? 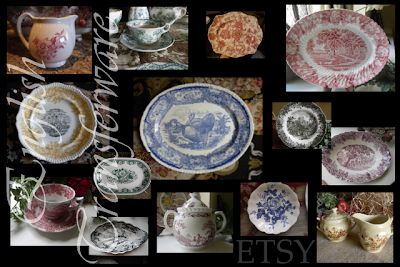 Well, Yvonne at Stone Gable is hosting a wonderful giveaway of transferware by Nancy of Nancy's Daily Dish. Nancy's etsy shop is a treat for the eyes! Follow this link to the rules at Stone Gable to have your own chance to win. I LOVE transferware! I have some Johnson Brother's which I love using in the fall. I'll have to go to Stone Gable and see what you have to do to win. We used to exchange comments on our blogs years ago! Just came across yours again and love your blog design. This transferware is beautiful! I have some brownwarefrom my great grandmother which I love. Hope you are doing well, Bettsi.